Today was one of those days in prison where alarms kept going off in various yards, and it was one code after another. We had a serious code on our yard that involved two inmates battering a third one. The C.O. up in the guard tower fired off a round to make them stop. In the meantime, the rest of the inmates on the yard were ordered over the PA system to prone out (get down on their stomachs), and luckily they all cooperated. At other institutions with more serious gang action, this sort of incident could quickly escalate into a riot: A fourth guy sees his homie getting beat up by two guys, so he runs in to help, and then a fifth guy does the same, and so on, and so forth, and then the next thing they all see is custody coming at them with batons and pepper spray and OC bombs. Last week in my Lifers Support Group, one inmate was remembering how Jason from the movie Friday the 13th scared him when he was little. This led to a conversation about things that they were afraid of when they were kids, and then the topic shifted to people deliberately getting their thrills by riding on roller coasters, going bungee jumping, skydiving. On a separate note: It’s finally the start of my three-day weekend. Every night this week I’d been knitting a few rows on the sweater, but now I have to admit that I’m getting a little bored with it. I’m thinking of starting another pair of socks. Here is just a portion of my sock yarn stash. I can’t decide which one to choose. Suggestions? Categories: Work (My Day Job) | Tags: knitting, prison, sock yarn, yarn stash | Permalink. OOO the pretty teal one for the socks! Good choice! It’s Patons Kroy self-striping yarn. I love the texture of it. I was actually leaning toward that one– now I think I’ll go with it! Yes 5:00 – And I am also growing very bored of my scarf (my first knitting project). I should have listened to the teacher and done a washcloth. I have already changed the pattern once by putting garter rows in the middle to it look like squares. Still boring. I know exactly what you mean. After a while, knitting a scarf becomes an exercise in monotony: it feels like it just goes on and on and on! And then it’s kind of like reading an uninteresting book– once you’ve started, you feel compelled to finish. I’m at about 2 feet. So… hmm… weird collar thingee? I do need to learn to bind off. Where do you get your patterns, online? I bought sock yarn today and some smaller needles. yikes! Maybe a cowl? Twist it to make a moebius strip cowl? I get my patterns from both books and online. Knitty.com is a good resource. 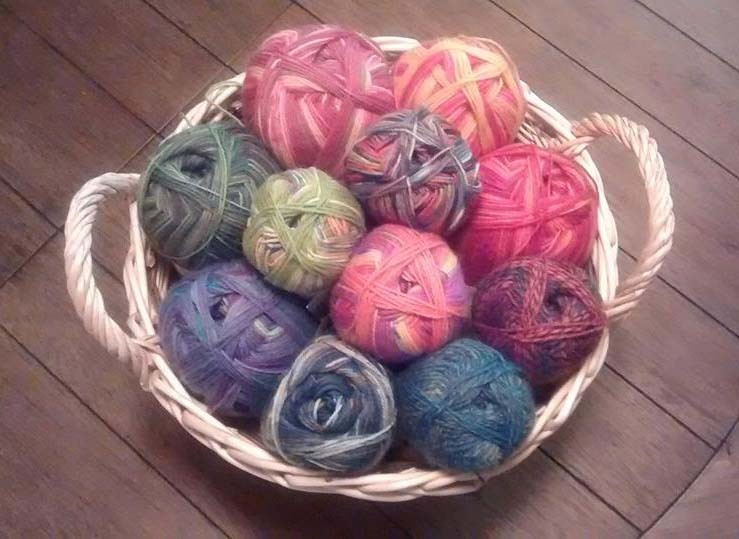 Have fun with your new sock yarn and needles! I’m excited for you. Ooh that is a lovely stash.